Mariner Finance donated $1,500.00 to Golden Harvest Food Bank on Friday December 14th, 2018. The Golden Harvest Food Bank provides quality food and groceries to hungry individuals across their 30 county service area. Since 1982, they’ve distributed more than 250 million pounds of food and fed more than 14 million people. Mariner Finance donated $1,500.00 to Akron-Canton Regional Foodbank on Friday December 14th, 2018. The Akron-Canton Regional Foodbank was formed in 1982 by a group of community leaders who made a commitment to provide emergency food to neighbors in need. Today, the Foodbank provides food and other essential items to member hunger-relief programs in eight Northeast Ohio counties: Carroll, Holmes, Medina, Portage, Stark, Summit, Tuscarawas and Wayne. These member programs operate nearly 500 food pantries, hot meal sites, shelters and other hunger-relief programs in the neighborhoods and communities where people need food. Mariner Finance donated $1,500.00 to Greater Chicago Food Depository on Friday December 7th, 2018. The Greater Chicago Food Depository is Chicago’s food bank. They provide food for hungry people while striving to end hunger in the community. They do this in partnership with 700 agencies and programs including pantries, soup kitchens, shelters and responses for children, older adults and veterans. This network distributes food where it is needed most throughout Cook County. Mariner Finance donated $1,500.00 to Foodlink on Thursday December 6th, 2018. Foodlink is a community food resource center and the Feeding America food bank serving Allegany, Genesee, Livingston, Monroe, Ontario, Orleans, Seneca, Wayne, Wyoming, and Yates counties. We leverage the power of food to transform lives, end hunger and build healthier communities. Through good stewardship, innovation and collaboration, Foodlink mobilizes a diverse network of partners and stakeholders to eradicate both the symptoms and root causes of hunger. Mariner Finance donated $1,500.00 to the Mississippi Food Network (MFN) on Tuesday December 4th, 2018. Mississippi Food Network (MFN) has been feeding Mississippians since 1984. MFN distributes more than 1.5 million pounds of food and feeds more than 150,000 every month — or a total of 1.8 million people per year. MFN takes donations from multiple sources, and distributes food and goods through 430 member agencies. Mariner Finance donated $4,000.00 to the Second Harvest of South Georgia on Thursday November 29th, 2018. Mariner Finance donated $4,000.00 to the Food Bank of Central & Eastern North Carolina on Thursday November 29th, 2018. The mission of the Food Bank of Central & Eastern North Carolina is: No One Goes Hungry in Central & Eastern North Carolina. Established in 1980, the Food Bank is a nonprofit organization that has provided food for people at risk of hunger in 34 counties for over 35 years. The Food Bank serves a network of more than 800 partner agencies such as soup kitchens, food pantries, shelters, and programs for children and adults through distribution centers in Durham, Greenville, New Bern, Raleigh, the Sandhills (Southern Pines) and Wilmington. Mariner Finance donated $1,500.00 to the Second Harvest Food Bank of Metrolina on Thursday November 29th, 2018. Second Harvest Food Bank of Metrolina (SHFBM) strives through education, advocacy, and partnerships to eliminate hunger by the solicitation and distribution of food. SHFBM has been in existence since 1981. We serve a total of 19 counties - 14 counties in North Carolina including Anson, Burke, Cabarrus, Catawba, Cleveland, Gaston, Iredell, Lincoln, Mecklenburg, Montgomery, Rowan, Rutherford, Stanly and Union. We serve 5 counties in South Carolina including Cherokee, Lancaster, Spartanburg, Union and York. Mariner Finance donated $1,500.00 to the Food Bank of Delaware on Wednesday November 21st, 2018. The Food Bank of Delaware, a member of Feeding America, formerly America’s Second Harvest, is a statewide nonprofit agency whose vision is a community free of hunger. Mariner Finance donated $1,500.00 to the Hoosier Hills Food bank on Friday November 16th, 2018. Hoosier Hills Food Bank’s mission is to collect, store and distribute food to non-profit agencies that feed the hungry in Brown, Lawrence, Orange, Owen, Martin and Monroe counties in Indiana. HHFB is a 501(c)(3) non-profit organization. Over 100 non-profit member agencies serve more than 25,800 individuals each year. In 2017, they distributed 4,223,459 total pounds of food and 1,154,936 pounds of fresh produce. Since opening in 1982, HHFB has distributed over 60 million pounds of food. Mariner Finance donated $1,500.00 to the Community Food Bank of New Jersey on Monday November 12th, 2018. The Community Food Bank of New Jersey’s mission is to fight hunger and poverty in New Jersey by assisting those in need and seeking long-term solutions. They engage, educate and empower all sectors of society in the battle. Working together with volunteers, donors and many partners, they work to fill the emptiness caused by hunger with Food, Help and Hope. Mariner Finance donated $1,500.00 to the West Alabama Food Bank on Friday November 9th, 2018. The West Alabama Food Bank, located in Northport, Alabama, works year round to end hunger by securing donations, and safely storing and distributing food to hunger relief programs. WAFB operates a 52,000 square foot warehouse with an onsite cooler and frozen storage. In 2017 there was an estimated 4 million pounds of food and supplies distributed throughout the West Alabama region. Mariner Finance collected funds through Jeans Day donations for our Tennessee community. We were able to donate $1,500.00 to the Second Harvest Foodbank on Thursday, September 7, 2018. Mariner Finance collected funds through Jeans Day donations for our Pennsylvania community. We were able to donate $1,500.00 to the Philabundance Foodbank on Thursday, July 19, 2018. In 1984 Philabundance was founded by an idealist named Pamela Rainey Lawler who saw perfectly good food going to waste, and, at the same time, saw people going hungry. What started out as a small food rescue organization operating out of a Subaru, 30+ years later, is an innovative, impactful and collaborative organization distributing more than 24 million pounds of food a year to those in need. Pictured Left to Right: Mariner Finance employees Dawn Pastorius, Liz Smith, Terry Graham, Chassidy Cunningham, LaNina Armstrong, and Jeff Zuch delivered donations collected at their branches in May for the Mid-Year Food Drive. Tuesday, June 12, 2018, Chassidy Cunningham and her team of branch managers had the awesome opportunity to hand deliver the Jeffie’s Choice food donations from our Mid-Year Food Drive to the Food Bank of Central and Eastern North Carolina. As a district, we donated 105 pounds of food which provided 88 meals to families in need in our area. Today, the Food Bank of Central & Eastern North Carolina has provided food for people at risk of hunger in 34 counties in central and eastern North Carolina for more than 35 years. The Food Bank is a network of more than 800 partner agencies such as soup kitchens, food pantries, shelters, and programs for children and adults through distribution centers. In fiscal year 2014-2015, the Food Bank distributed more than 57.2 million pounds of food and non-food essentials through these agencies. Unfortunately, food insecurity remains a problem with more than 630,000 people struggling to access nutritious and adequate amounts of food. Mariner Finance Headquarters participated in Volunteer Week this year at the Maryland Food Bank. 49 employees donated their time at the food bank preparing and packaging food. Headquarters also collected and delivered 172 food items as part of the mid-year food drive. 682,280 individuals in Maryland report food insecurity which translates to about 1 in 9. With today’s stagnant wages and increasing cost of living, individuals are working full time and still struggling to put food on the table. 33% of food insecure individuals in the area earn too much to qualify for federal or state relief, which means there are thousands of food insecure Marylanders who rely solely on the food bank and other hunger relief agencies to meet this basic need. In conjunction with Warburg Pincus, Mariner Finance donated $2,500.00 to the Maryland Food Bank. That equals 7,500 additional meals for those in need! You can read more about our Volunteer week on the Mariner Finance Blog. 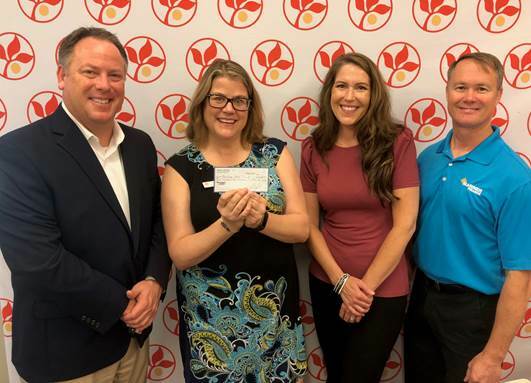 On April 24, 2018, Mariner Finance Assistant Manager Nicole Parker (left) and Branch Manager Cameron Coulson (right) of the Fredericksburg, VA branch delivered a $1,500 donation to Dayna Klein (middle) at the Fredericksburg Regional Food Bank. The Fredericksburg Regional Food Bank helps to provide nutritious food to over 34,000 people through the network of more than 70 partner agencies and 90 program partners in the community. Established in 1982, the idea was to re-distribute food through retail and wholesale food outlets. During that first winter, the facility distributed 13,000 pounds of food to those in need. In 2016, the Fredericksburg Regional Food Bank collected and distributed over 3.8 million pounds of food and other grocery products. The donation, made possible by Mariner Finance and Jeffie’s Choice, provided over 3,000 meals to those in need in the Fredericksburg, SC area. Mariner Finance representatives Gary Smith and Joe Keys are thanked by God’s Pantry Food Bank CEO Michael J. Halligan for their generous gift to feed hungry neighbors in Central and Eastern Kentucky. 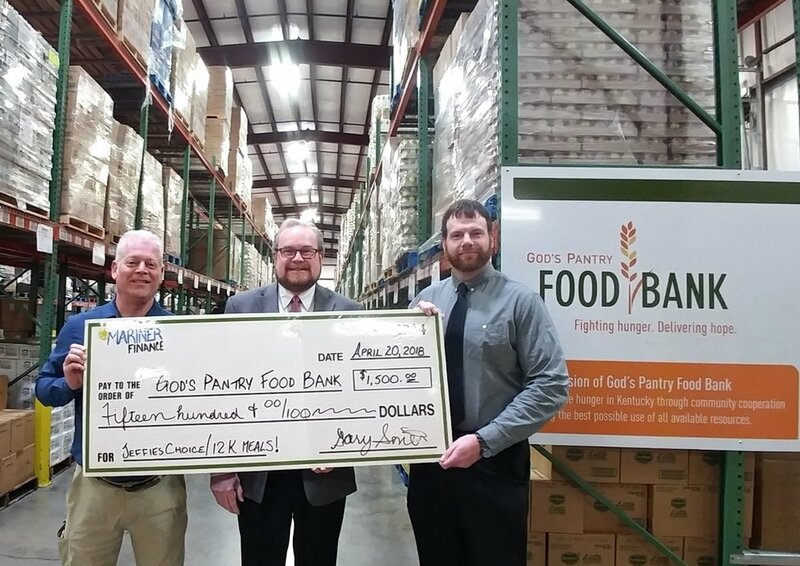 Gary Smith and Joe Keys of Mariner Finance visited God’s Pantry Food Bank in Lexington, KY to deliver a $1,500 donation on April 20, 2018. In 1955, community activist Mim Hunt began distributing food out of her basement to those in need, and throughout the years her small effort grew into the large-scale hunger relief organization that God’s Pantry Food Bank is today. God’s Pantry Food Bank is a member of the 200+ food banks that make up Feeding America. They are also a member of the Kentucky Association of Food Banks working with other Kentucky Food Banks to maximize effectiveness throughout the state of Kentucky. With every $1 provided, God’s Pantry Food Bank can gather and distribute enough food to create 8 meals. Mariner’s gift through Jeffie’s Choice is already at work providing 12,000 meals to hungry children, seniors and families in 50 Central and Eastern counties. Friday, April 13, 2018, Mariner Finance collected funds through Jeans Day donations for our Utah community. We were able to donate $1,500.00 to the Community Action Services and Food Bank. This donation provided 4,500 – 6,000 meals for those in need! Community Action Services and Food Bank is the second largest food bank in Utah. Last year, nearly 5 million pounds of food were collected and distributed by the food bank to partner agencies throughout Utah, Wasatch and Summit counties. Community Action Services and Food Bank offers other services such as financial education, home buyer education, a culinary kitchen for small business owners just starting out and much more! Angie Doran, Branch Manager of Mariner Finance in Huntsville, Alabama, delivered a $1,500 donation to Laura Fincher at The Food Bank of North Alabama on January 18th, 2018. The Food Bank of North Alabama started with a small group of committed volunteers in 1984 by borrowing a desk from the Huntsville Madison County Senior Center and making calls to local farmers. The food bank provides 8.5 million pounds of food a year to a network of over 240 food pantries, shelters, and children’s programs to 11 counties in North Alabama. With donations like this, the food bank is able to feed over 80,000 people at risk of hunger each year. Jeffie’s Choice is a tax-exempt organization as described in Section 501(c)(3) of the Internal Revenue Code.